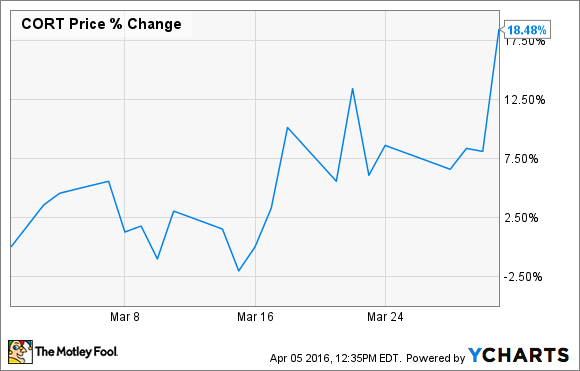 Corcept Therapeutics Rose 18% in March. Here's Why. Credit an earnings report chock full of better-than-expected news, plus optimism about drugs in clinical trials, for investors' upbeat view on this small-cap biopharma. What: Shares of Corcept Therapeutics (NASDAQ:CORT), small-cap biopharma focused on developing products for the metabolic, psychiatric, and oncologic markets, gained more than 18% in March, according to data from S&P Global Market Intelligence. So what: A better than expected fourth-quarter earnings report got shares moving early in the month, and they continued to head higher from there. The company recorded a net income of $959,000 for the quarter, or $0.01 per share, which was much better than the consensus forecast of $0.02 per share loss. Total revenue for the quarter came in at $15 million, which was up 66% compared to the same period in 2014. Looking ahead, the company is guiding for total revenue in 2016 of between $76 million and $81 million, which would represent another year of fast growth after recording revenues of $50.3 million in 2015. Now what: The company ended the year with more than $40 million in cash in its books, and analysts are projecting the company will show a slight profit for the year, which should help ensure that it has access to plenty of capital to continue its rollout of Korlym, an oral therapy for treating hyperglycemia associated with Cushing's syndrome. Of particular interest to investors should be CORT 125134, which is starting two Phase 2 trials as a potential treatment for Cushing's syndrome and solid-tumor cancers. Another interesting study it has underway is a Phase 1/2 trial using Korlym in combination with eribulin, the chemical name of a drug owned by Japanese pharmaceutical company Eisai to treat triple-negative breast cancer. Since patients with triple-negative breast cancer have tumors that do not respond to traditional cancer treatments, this looks like an exciting area for Corcept to explore. Roughly 40,000 women are diagnosed with triple-negative breast cancer each year in the U.S. alone, and since there is not a FDA-approved treatment available for them, if Korlym proves to be effective, it could be a massive home run for the company. The company expects to have efficacy and safety data from this trial in hand by midyear, and if all goes well, it could be entering a phase 3 trial soon after. With a good-looking earnings report in the rear view mirror, and the company making progress on its solid pipeline, its easy to understand why the market treated its stock so favorably in March.